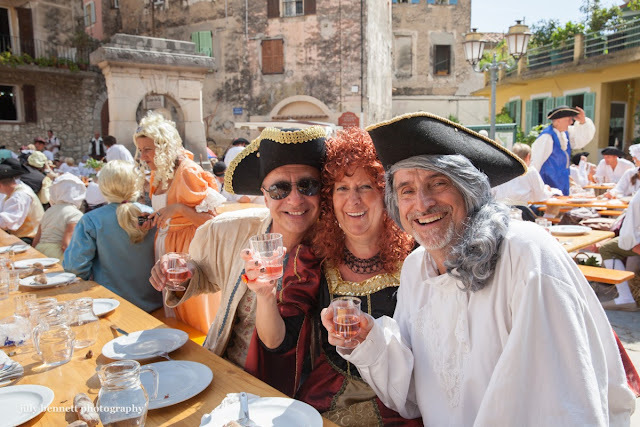 Menton Daily Photo: Fête de l'Orme - the Feast! 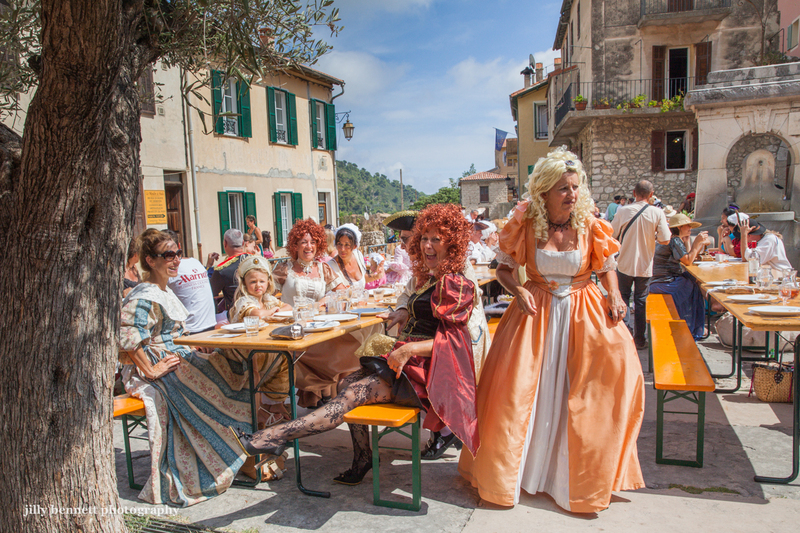 This is how the villagers of Gorbio celebrated the 300th birthday of Gorbio's elm tree. Two hundred and thirty fabulous costumes, feasting, laughter, joy, fabulous musicians, dancing - we'll see it all. The lady showing a leg is Marie-France who is one of Gorbio's amazing volunteers - she, along with others who worked so hard, chopped vegetables for hours and hours, making a marvellous gratin of courgettes and another with pumpkin, turnips and polenta to go along with the roast sucking pig and wild boar. C'est ainsi que les habitants du village de Gorbio ont célébré le 300e anniversaire de l'orme. Deux cents trente magnifiques costumes, le banquet, des rires, de la joie, des musiciens fabuleux, des danses - On verra tout cela. La dame montrant une jambe s'appelle Marie-France, l'une des merveilleux bénévoles de Gorbio. Avec d'autres, elle a beaucoup travaillé, hachant des légumes pendant des heures et des heures pour faire les délicieux gratins de courgettes, de citrouille, de navets ou d'aubergines qui accompagnaient les rôtis de cochon de lait et de gibier. GORBIO must be UNIQUE and a great place to live! It was great! I enjoyed every minute while I was there!